were blown to the floor. One was seriously injured and a seated passenger had to hold on to her to keep her in the aircraft. The other attendant crawled along the aisle, clinging on to seat legs and comforting passengers. Not all of the structure had torn away cleanly. There were jagged bit of metal being battered by the slipstream, then breaking loose and spearing back among the passengers. 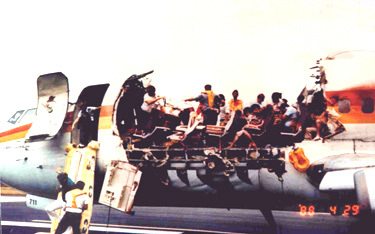 Most of the passengers were injured, seven seriously. (Investigation Four Years Later By Martin Aubury).